Great Care. Delivered. We care about cost control. For veterinarians, a critical component of cost control is inventory control. That's why we developed QuadTabs®: tablets scored twice for maximum flexibility in dispensing and dosing. Now you can order a single dosage-strength of QuadTabs and dispense up to four doses from each tablet. Not only are they more economical for you, your clients will appreciate them, too, because they won't have to wait for a special dosage-size. Best of all, the precision scoring makes it easy to snap-off a half or quarter tablet with ease. We care about the high cost of non-compliance. Here are eight ways to make non-compliance a non-issue. Give pet owners information about the dangers of non-compliance. Give pet owners simple, detailed instructions and easy administration techniques. Prescribe medications that taste good. Prescribe medications that are small and easy to administer. Prescribe medications that are more affordable, when possible. 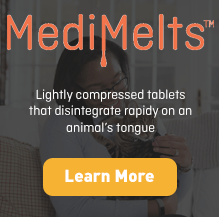 Make it easier, safer and more convenient for pet owners to get the medications they need. Increase communication and follow-up with pet owners. We care about doing our part. We're committed to ensuring that your patients not only receive the proper medications they need, but also continue to take them as prescribed. 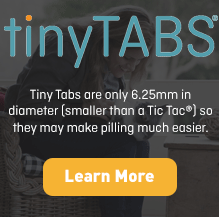 You can turn to us for hard-to-find medications, smaller-than-a-Tic-® Tiny Tabs®, Bitter-Block™, Low-Dust Granules, Medi-Melts®, Quad tabs®, the Twist-a-Dose® transdermal gel applicator, the Twist-a-Taste® oral gel applicator, more than 30 animal-friendly flavors like fish, liver, chicken, beef, and tutti-frutti, and compounded medications to meet your exact specifications. You and your clients also can turn to our online learning center for scores of professional monographs. 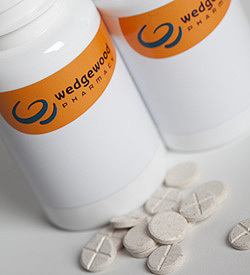 Turn to Wedgewood Pharmacy to help maintain the health of the animals in your care. As the nation's largest animal-health compounding pharmacy, our specialized compounding pharmacists have helped to solve unique medication problems for animal-health practitioners since 1981. 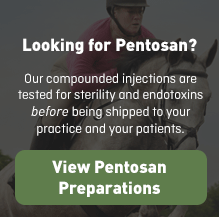 Serving more than 40,000 human-health and animal-health prescribers, we have the experience and resources to help you to solve many complex medication-compliance issues. If you do not find the specific compounded medication, dosage form and/or flavor that meets your needs, please call our customer care specialists at 877-357-6613.